11″x17″ Graphite on 2 ply smooth bristol. I undertook to make a visual statement; however, this was the first one and I was half way through just rendering some grapes for practice when I became inspired to do a fancy set, so this image has only a beginning fantasy element to it (and very understated at that). 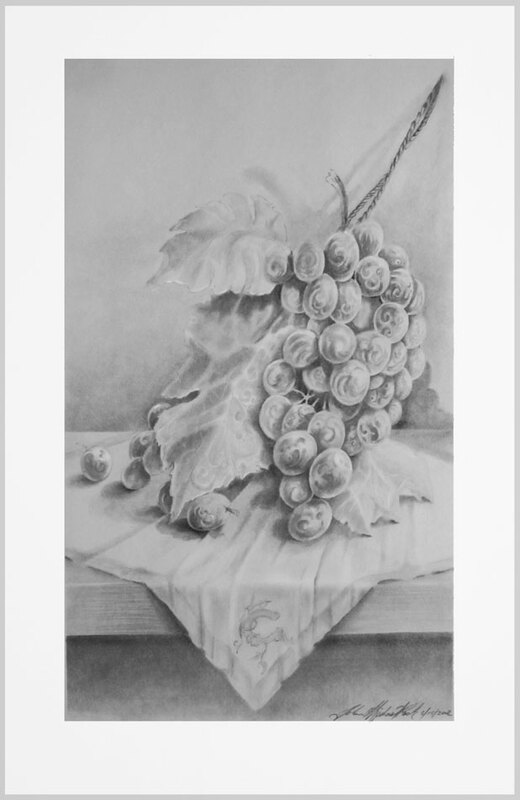 The image is one of five in a set of fantasy fruit graphite renderings (named Fancy Fruit) inspired by how fruit tastes to me. Each one became a little more “fancy” not to extreme, just fancy. It was originally meant to be just a black and white study piece, but after the muse came, it became a set of 5, and now I think the idea would be better in color. However, so many other paintings have come into mind, and before that happens I worry that I will ever get new color work done on this. If I do, they won’t look the same, something wilder with splashes and juicy drippings I think. Bristol is a very durable material, I love working on it. You can work, re-work, erase, and glaze this material many times before it fatigues. If you make mis-judgments, (me-I never do)-(well, that is not true) that is why I use bristol; it is very forgiving. I will get the other four images posted late this week. This entry was posted in Drawing and tagged FAntisy fruit, Graphite on April 29, 2013 by eightdecades. Gee I didn’t know the blog was loading slow, I have had comments asking how I get it to load fast.